Habitats for Humanity Thunder Bay volunteers have been working on a project very close to home. The not-for-profit organization recently officially opened its newly renovated Restore to the public, located on 660 Squier Street. For the last 7 months, volunteers have been constructing a 6000 square foot expansion, along with working on a new roof, office space and an entire interior makeover. With the new space, the ReStore will not only be able to sell a larger quantity of retail, but will also become a donation hub for slightly used appliances, building accessories, and furniture for re-sale. Habitat for Humanity Thunder Bay ReStore, Manager, Tyson Neil, says; “Thanks to the huge amount of support from the community we have outgrown our previous building and we were in desperate need for more space. 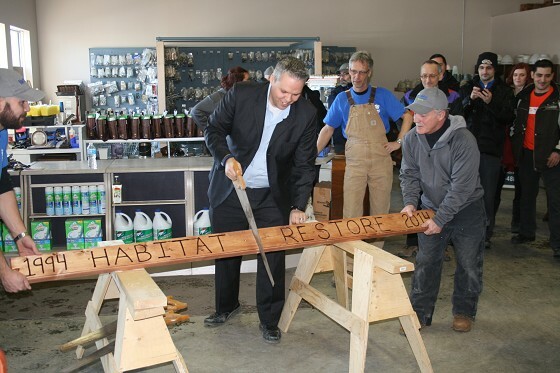 Over the last five years the ReStore has really boomed, doubling in sales, to become the ‘one-stop-shop’ in Thunder Bay for those looking to buy or recycle renovation materials. The ReStore renovations will support future growth and profitability for the operation.